Removal of Water from 100 ppm down to 10 ppm and from 50 ppm to 5 ppm in a single pass and down to 3 ppm after 3 passes (ASTM method D-1533). Reduction of Gas content from fully saturated with air (10 to 12% by volume) to less than 0.1 % (ASTM D-2945). This Oil Purification plant will have horizontal Vacuum Column with Coalescers. Vacuum Chamber Vessels and all internal parts are made of carbon steel and feature Coalescers, Sight Glass, Oil Level Controller and Vacuum Gauge. 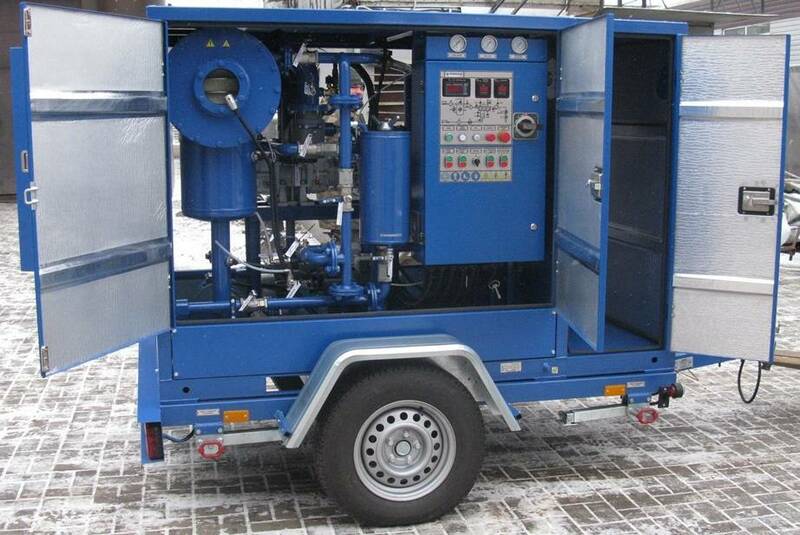 Vacuum Chamber’s rigid design makes it suitable for stationary and mobile installation. 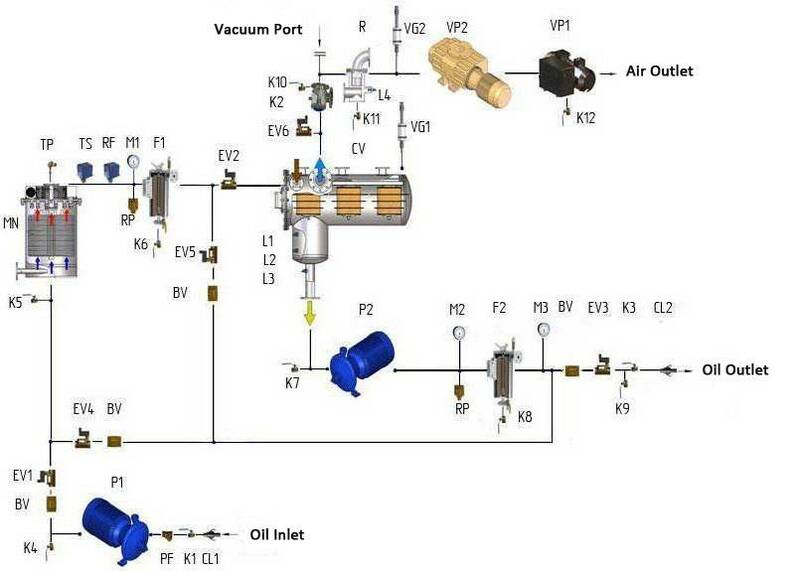 Appropriate flexible connections are provided to the outlet pump and inlet pump to minimize negative effect of vibration during plant operation and transportation. Vacuum Chamber: 1–Oil Inlet; 2–Vacuum Pump Connection; 3–Coalescers; 4–Oil Outlet; 5–Level Sensor; 6–Sight Glass Coalescers – four built-in coalescers are provided for the maximum exposure of oil to the effect of vacuum. Due to reduced pressure dissolved water and gases are vaporised through secondary chamber and filter into atmosphere. 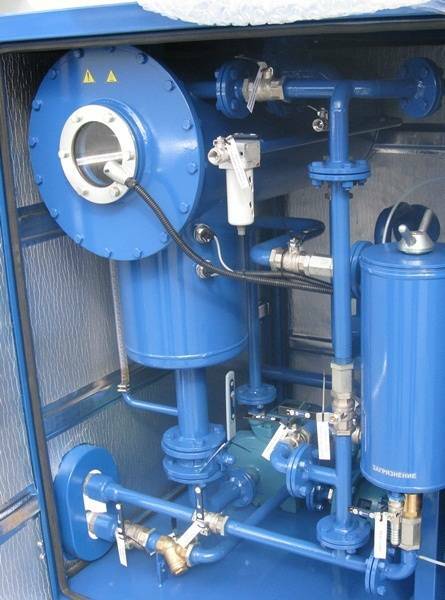 Secondary Chamber (Oil Trap) – serves as safety feature to ensure that no oil is pulled into the vacuum pump. It is equipped with oil level sensor which will activate the alarm in case of oil presence. 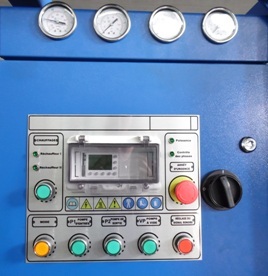 Oil Level Controller – consists of three capacitive probes provided to maintain required level of oil in the Vacuum Chamber. Vacuum Gauge – is provided to monitor Vacuum level in the Vacuum Chamber. Vacuum gauge will be absolute type with display in mbar. Vacuum ports – vacuum connection is provided to pull vacuum on transformer. Sampling Ports – inlet and outlet oil ports are provided for incoming and processed oil. The electric oil heating facility will be provided in 2 stages offering a total of 55 kW of power. A low watt density encapsulated heating elements (1.2 W/cm²) are used to prevent heat degradation of oil. The Heater is controlled by electronic temperature controller. 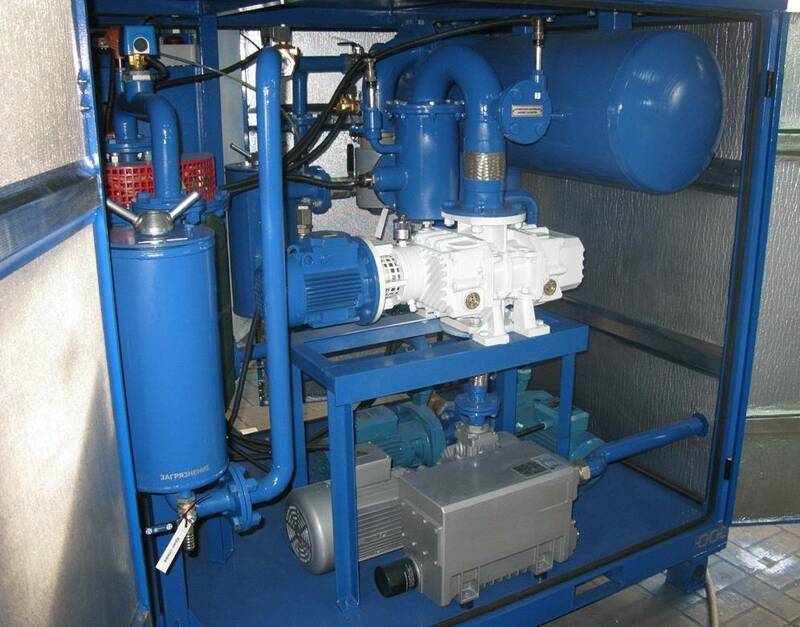 Inlet Oil Pump: “Calpeda” Centrifugal Pump with power consumption of 1.5 kW and maximum capacity of 6 m³/h. 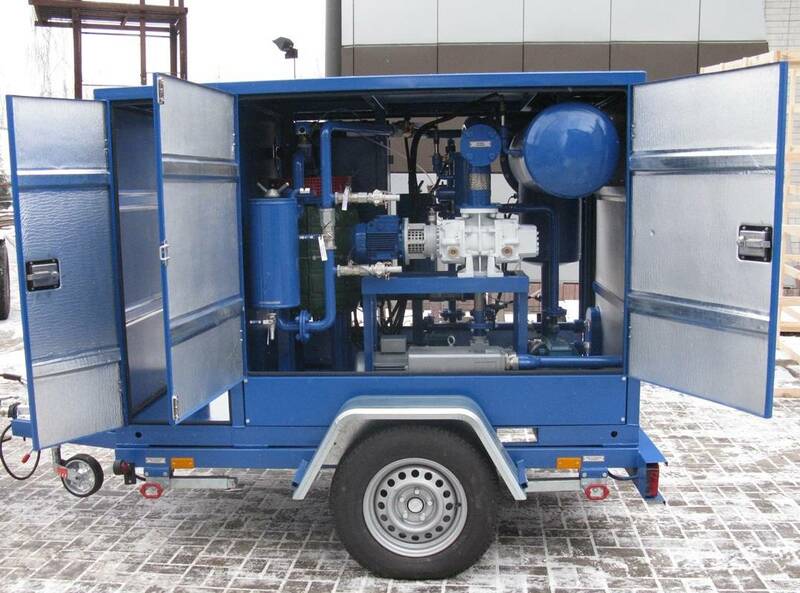 Outlet Oil Pump: “Calpeda” Centrifugal Pump with power consumption of 2.2 kW and maximum capacity of 6 m³/h. A 90 micron Mesh Strainer is provided to remove large particles that could cause damage to the Inlet Pump. 25 micron Coarse Filter is installed on entry to the Vacuum Chamber. Oil receives its final treatment by passing through the 5 micron Fine Filter designed to remove 99.9% of particles larger than 5 microns. GlobeCore’s CMM plants feature the following safety devises which ensure simple and reliable operation and will safely shut down the system in case of any alarm situation: High Level Alarm – will alert plant’s operator by activating sound and light alarms and shut down the system safely should high level of oil persist. Low Level Alarm – interlocked with the inlet pump low level alarm will safely shut down the plant in case of insufficient oil level. 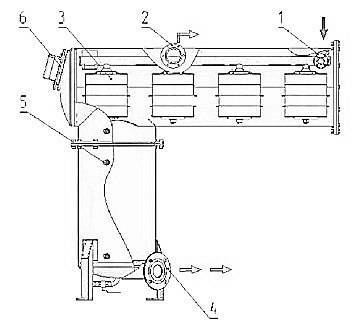 Flow Sensor – only activates the Heater when oil flow is detected. Overloads – all motors are protected by overloads. Alarms – sound and light alarm with silence button will alert plant’s operator of any emergency situations. Foam Sensor – prevents excessive foaming. Plants automated operation will be controlled by Mitsubishi Alpha 2 Programmable Logic Controller. Heating and filtration mode: oil goes through the unit via valve K1, mesh filter РF, valve K10 pumped by oil pump P1 through the oil heater MN, cartridge filter F1, ball valve K2, K5 to the unit output. Filtration, heating and thermo-vacuum oil purification: transformer oil is fed through valve K1, mesh filter РF, valve K10, oil pump P1 through oil heater MN, cartridge filter F1. Heated to temperature (50…60ºС) and purified from mechanical impurities oil is fed through ball valve K3, comes into vacuum column CV, passes through coalescers. Vacuum in the chamber is created by vacuum pump VP. Vacuum value in the chamber is maintained by means of the valve К11 and controlled by vacuum gage VM. Air is supplied into chamber through moisture eliminator FV, ascending air carries out gases and water vapour from the oil surface and in this way the oil is dried. Wet air is subsequently removed into atmosphere via vacuum pump. 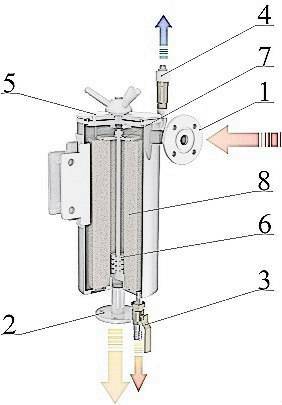 Oil from the column is fed to the transformer by oil pump P2 through valves K8, K9, cartridge filter F2, return valve SV and ball valve K5 into the tank for clean oil. The K3 valve establishes necessary flow rate. 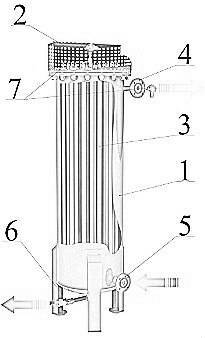 The vacuum in the column is created by vacuum pump VP1 and maintained at 0,8 bar during operation. Vacuumizing of transformer: is carried out by pump VP through valve for vacuumizing of the external equipment. 5 Oil heater power, kWt, max. 6 Maximum power consumption, kWt, max.